Wurst has been updated to version 5.6.2 and includes support for Minecraft 1.11.2. ScaffoldWalk, New Bypasses + more! Killaura, KillauraLegit, ClickAura and BowAimbot will now prioritize targets based on their angle to the player’s server-side rotation instead of their distance to the player. This minimizes fake-rotations made by those features, increasing their speed while also making them harder to detect. Improved NoCheat+ bypass, range, accuracy and performance of Nuker. Improved NoCheat+ bypass, range and accuracy of NukerLegit. Improved NoCheat+ bypass and accuracy of Tunneller. Improved NoCheat+ bypass of BonemealAura. Improved NoCheat+ bypass of AutoBuild. Improved speed and performance of Kaboom and SpeedNuker. 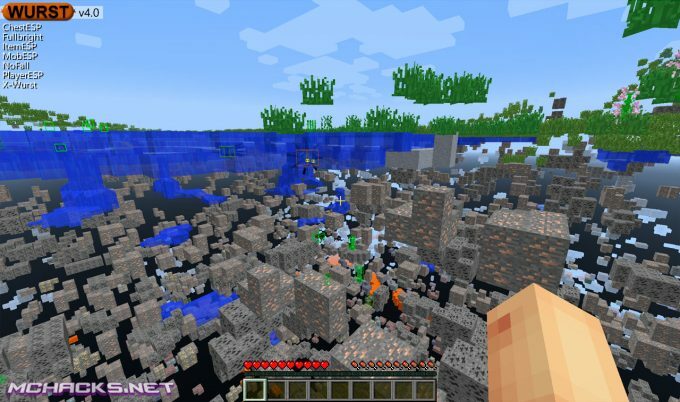 Kaboom and SpeedNuker will now work in both survival and creative mode. Kaboom and SpeedNuker will no longer get you kicked from the server quite as often. 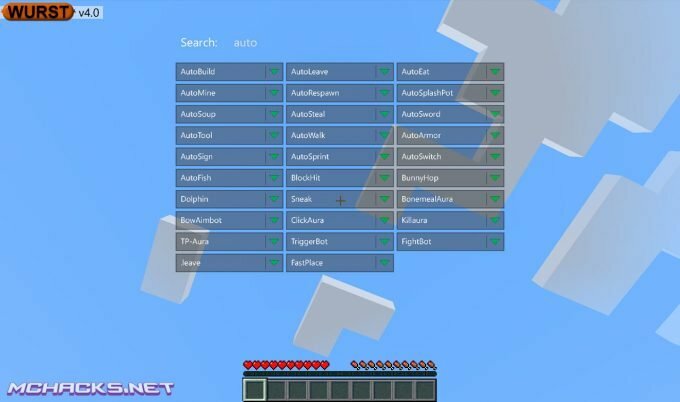 Renamed the “Mineplex AntiCheat” mode in YesCheat+ to “Mineplex”. Changed default FastBreak mode to “Instant”. Fixed TemplateTool not being able to scan very small objects. Fixed TrueSight not showing invisible entities. Fixed Wurst AI not climbing up vines correctly. Fixed KillauraLegit rotating too quickly. Removed BlockHit, as block-hitting with swords is no longer possible. Removed the “version” button on the multiplayer screen. Instead, Wurst will now automatically select the correct protocol version whenever you connect to a server. Further improved automatic protocol selection. Download free, see links below.